Toornament fully supports League Of Legends Tournament Codes! These codes will help you tremendously by putting your participants in the right lobbies and automatically retrieve scores from their games and results for their matches. Make sure to enable the Tournament Codes as soon as possible on your tournament, and before you open your registrations, so people who register fill their Summoner Names in! Also, with our new Match Formats, make sure your tournament uses "Result-Based Calculations" for any structure or format you are using (Leagues, Elimination etc. and Best-Of-One, Best-Of-Three etc.) for the system to automatically calculate global results and rankings. 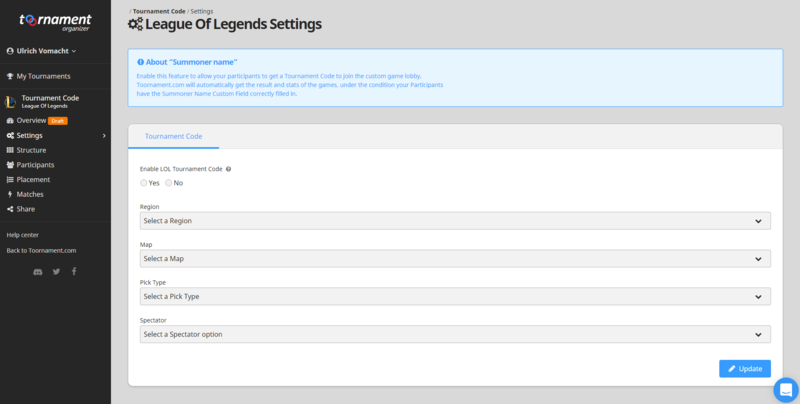 Enable the "Tournament Code" functionality in "Settings" -> "League of Legends" and fill in the necessary information. We recommend activating the feature BEFORE you open your registrations or create your participants, as they will need a valid "Summoner Name" custom field filled in! Beware though, once you've validated, there is no going back, so please make sure to double check your settings! 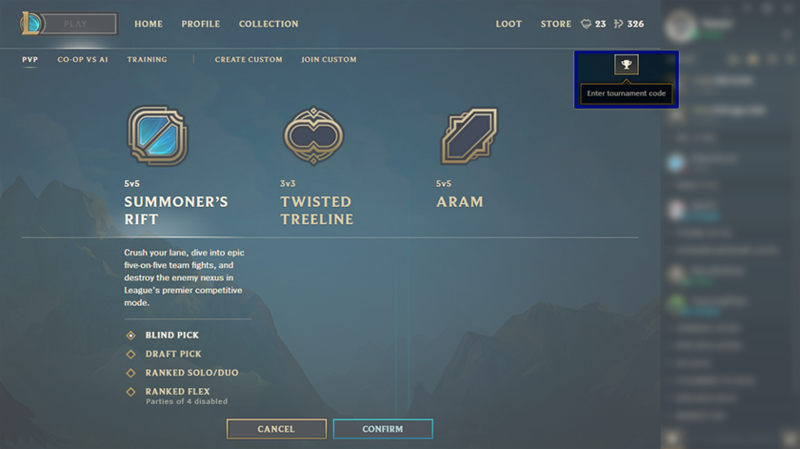 Launch the LoL client and select "Play". Then click on the Tournament button (with a little trophy on it) in the top-right corner, and paste your code in the field. Important: the participants must have their Summoner Name filled in, which is a Custom Field automatically created when activating the feature. Make sure at least one member of each team has it filled in correctly as it is used to match the result between Riot servers and our servers. You’re set! 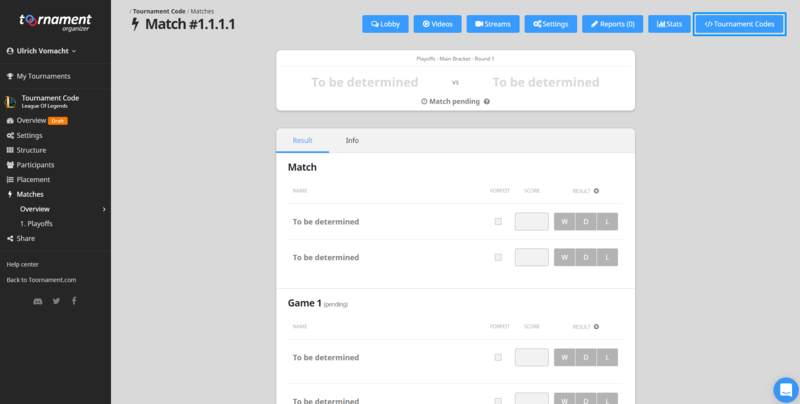 The post-match results will automatically show in Toornament, and the Detailed Statistics like picks and K/D/A can be displayed by going to the Stats tab, and validating the URL that have automatically been entered (this action may need a few minutes after a match has ended to work, time for the Riot API to create and dispatch the data). If all the participants leave the game during the Pick & Ban phase or during the early game, they can rejoin it with the same code. The game will be reset but the code, results and stats will still work.